Tales of the acoustics at the 2300 year-old Greek theater of Epidaurus tend to be told in terms of superlatives. Not actually justified, according to measurements taken by researchers from Eindhoven University of Technology. They are the first to detail the acoustics of three ancient theaters, with over 10,000 measurements, which confirms that when actors speak very loudly, they can be understood perfectly well right up to the back row. However, the tearing of a piece of paper or a whisper is only audible up to about halfway up, in contradiction to the many claims. Other examples cited in the travel guides to illustrate the excellence of the acoustics include the sound of a falling coin and the striking of a match. The Eindhoven study in Epidaurus, however, reveals that the tearing of paper or a falling coin can only be heard up to about halfway up. As for the sound of a matchstick being struck, you have to sit even nearer to the stage to hear it while you can only make out a whisper if you're sitting in the front row. All these sounds are just about audible further away but they are so subdued that they are not recognizable to the listener. In none of the three theaters studied did a voice at normal volume appear to be intelligible in the uppermost row. Words spoken very loudly with a good deal of projection were, however, are quite intelligible right up to the highest seats in all three theaters. The researchers therefore came to the conclusion that while the acoustic quality of these theaters is good, it is nothing special. The results were presented earlier this year at the scientific conference Acoustics '17 Boston. 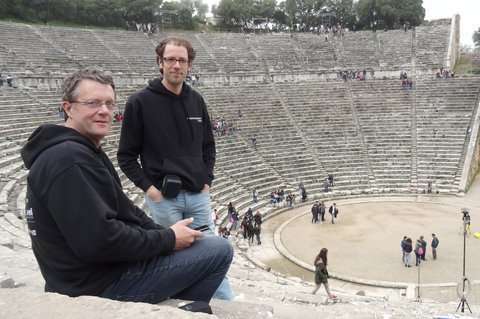 The research team investigated the Odeon of Herodes Atticus (200 AD), the theater of Argos (200 BC) and the theater of Epidaurus (400 BC), this last being the subject of great praise for its acoustic quality. In all three theaters the researchers undertook multiple readings from hundreds of spots to get a picture of the audibility of sounds throughout the auditorium. They also did this at different times of the day since differences in temperature and humidity can cause the acoustics to change. They compared the results with their own data on the recognizability and audibility of the aforementioned sounds, like a falling coin. In addition, they also took separate readings to examine the speech intelligibility. The researchers were able to pinpoint the acoustics so well thanks to a new method of measuring that they had developed themselves. Using a wireless system, they were able to take measurements from many different spots very quickly. This may seem simple, but it is essential since acoustic measurements can be distorted by the slight delays that may occur between the separate play and record equipment. Such delays are due to the clock speed of the equipment, which is never exactly the same. The Eindhoven researchers managed to solve this problem. The study had been prompted by a travel guide, with all the usual superlatives about the acoustics, that had lain for some thirty years in the bookcase of research leader Constant Hak. As an acoustician he had always wanted to measure those acoustics in detail, and the newly developed method of measuring made this possible. So together with researcher Remy Wenmaekers and TU Eindhoven Master students, he travelled to Greece to perform the measurements. Regardless of the findings, the experience of the theaters has a magical quality for Hak and his colleagues. And, he underlines, the acoustic quality is good. But the almost mythical acoustics in which the travel guides rave about should, the team believes, be tempered with a pinch of realism.